Firefighters Making Tentative Progress Against Deadly California Wildfires The largest Carr Fire, which has engulfed more than 100,000 acres and killed 6 people, is now 23 percent contained. Meanwhile, the Ferguson Fire west of Yosemite National Park is 30 percent contained. 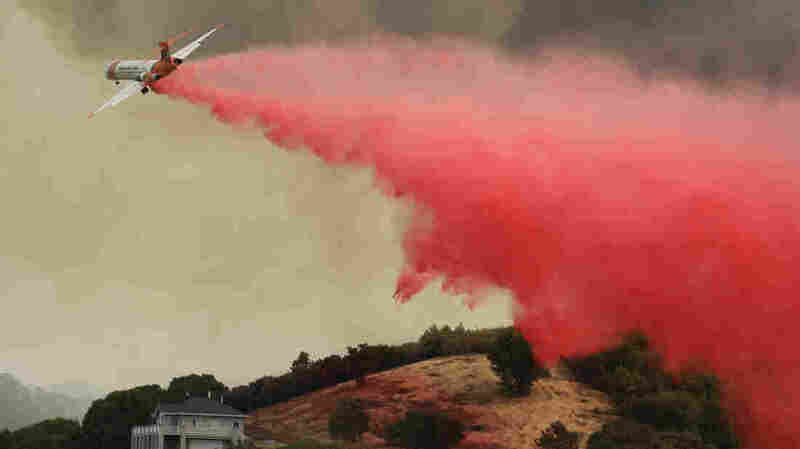 A plane drops retardant over a property threatened by a wildfire, on Monday in Lakeport, Calif. Member station KQED's Jeremy Siegel reports from Redding that authorities in Shasta County, hardest-hit by the Carr Fire, are starting to let some of the thousands of residents who were evacuated at the height of the blaze to return home. Authorities, however, are facing questions about how quickly they warned people to evacuate ahead of the deadly fire, which jumped the Sacramento River last Thursday and burned through parts of Redding. Ed Bledsoe, whose wife, Melody and his great-grandchildren, aged 4 and 5, were killed in his Redding home as the flames came through last week, explained to CBS News. Asked whether he received an order to evacuate, Bledsoe replied "Nothing. Absolutely not a word." "Nobody told us nothing. If I'd have any kind of warning, I'd have never ever left my family in that house," he said. Shasta County Sheriff Tom Bosenko told CBS that an investigation into whether the Bledsoe home received a warning call or a knock on the door was underway. The sheriff cited evidence that door-to-door notifications were made in the area, according to The Associated Press. Meanwhile, twin fires in Mendocino and Lake counties caused the evacuation of 20,000 people in northern California. 'We have experienced fires the last four years, and so we're very aware of what can happen with fires and the damage they can cause,' Lake County Sheriff Lt. Corey Paulich said."